A downloadable poster to celebrate the visit of the Duchess of Cambridge has been produced by a weekly freesheet. 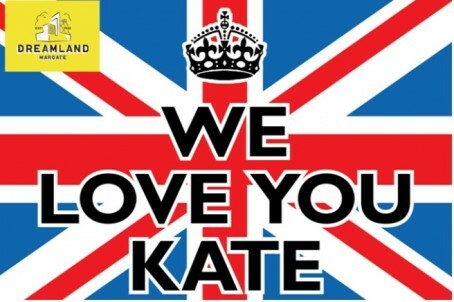 The Thanet Extra has produced the ‘We Love You Kate’ poster for readers to pin up during her visit next Wednesday. Her visit to the Turner Contemporary art gallery, in Margate, Kent, is likely to be one of her last public engagements before she gives birth to her second child. The poster, pictured below, has been produced in association with the Dreamland Margate amusement park. Urging readers to download the poster, editor Leo Whitlock said: “This is thought to be one of Kate’s last public engagements before she gives birth to her second child which is due in April. “Put the poster in your window to show your support for the Duchess, the Royal Family and to wish her luck as labour looms large. “We don’t know the route she will take so let’s plaster the whole place with posters to show her and the rest of the world how proud we are of her and how proud we are of the place we live and work in. HaShem bless You, William , George and baby! I hadn’t actually noticed the bright yellow advert (for HTFP readers who also might have missed it, it is in the top left hand corner) gracing our country’s flag. Huzzah to the Thanet Extra for tastefully accommodating the people’s admiration for Kate, our innate patriotism and the needs of advertisers. Feudalism is alive and kicking on the Isle of Thanet. Nauseating. The Union Flag hi-jacked by big business. There’s only one room in the house where I would put this..